Located 78 Miles Southwest of The Loop. 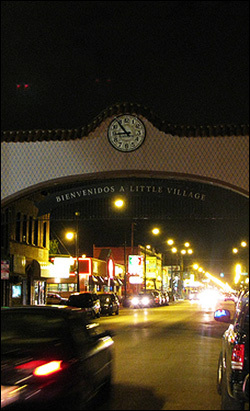 Now predominantly inhabited by new Mexican immigrants, Little Village (part of South Lawndale Community Area) was originally settled by Eastern European and Irish immigrants in the late 19th century, after the Great Chicago Fire sent the population of Chicago rippling out from the city’s center to the outlying countryside. Jobs created by industrial development in the early 20th century also attracted residents to the Little Village area, adding to the community’s strength and viability as its own independent borough. By the mid-20th century, Little Village saw a marked increase in Polish immigrants, escaping the ravages of war-torn Europe, and in the 1970s a large influx of Mexicans moved to the neighborhood. Many of these new residents were transplants from neighboring Pilsen. They were displaced during the construction of the University of Illinois Chicago campus, which chewed up a large section of residential land, pushing inhabitants further west from downtown. But it is the injection of Latino culture that gives the Little Village neighborhood its vibrant and distinct character today. In fact, the neighborhood is called “Mexico of the Midwest” by many of its residents. Little Village celebrates Mexican Independence Day every September with a parade down 26th Street. It’s the second largest Hispanic parade in Chicago. The 26th Street Mexican Independence Parade attracts thousands of spectators each year who flock to the neighborhood to show support and pride for their heritage. Of course, Little Village has a wealth of great Mexican restaurants that also help to reinforce the community’s strong cultural ties. It is usually a proud blue-collar, working-class neighborhood but many others live in poverty. For green spaces and recreation in Little Village, residents can make a visit the community parks. Washtenaw Park has a baseball diamond and offers up a variety of arts and crafts classes for adults as well as day camps for kids. Shedd Park is a little park in Little Village named for John G. Shedd (known to most Chicagoans as the founder of the Shedd Aquarium). Piotrowski Park is the neighborhood’s largest public park and is the most popular outdoor retreat for Little Village residents. Famous past residents of Little Village include Mayor Anton Cermak, who lived in the 2300 block of S. Millard Avenue, across the street from Lazaro Cardenas Elementary. Pat Sajak was also a Little Village resident. He attended Gary Elementary Schools and Farragut High School. Marshall Square is in the northeast corner of the South Lawndale Community Area, named to designate the square formed by Marshall Boulevard, 24th Boulevard, Cermak Road, and California Avenue. It is bounded roughly by Kedzie Avenue. on the west, 26th Street on the south, the BNSF Railway tracks (2000 S.) on the north, and the north/south railroad tracks (2500 W.) on the east. The bulk of the Marshall Square neighborhood falls within the aldermanic boundaries of the 12th Ward. According to the Chicago Public Library Marshall Square Branch webpage, James A. Marshall, for whom Marshall Boulevard was named, came to Chicago in 1832, opened a dancing school and served as secretary of the Chicago Real Estate Board. Although these days Marshall Square is widely considered by many of its residents to simply be the easternmost part of Little Village, with many businesses in the area using the Little Village name, the architecture reflects the distinct style of Pilsen homes. Marshall square also has close ties with the southeast corner of North Lawndale, with a sizable Mexican population around the southern half of Douglas Park. Points of interest include: the art-deco Marshall Square Theater at Cermak Road and Marshall Boulevard, which was originally a vaudeville venue, later a silent movie theater, and currently a venue for banquets, weddings, and Latin music under the current name of “Apollo’s 2000”; the remaining building of the former Albaugh-Dover mail-order warehouse and factory on Marshall Boulevard at 21st; the massive Carter Harrison High School at 24th Boulevard and Marshall Boulevard, now an elementary school named for Maria Saucedo, an area teacher who lost her life in a fire in 1981, and is the alma mater of clarinet player Benny Goodman and newspaper columnist Irv Kupcinet; and the highly visible statue of Marquette and Joliet which stands at the junction between Marshall and 24th Boulevards. The Chicago Transit Authority’s Ravenswood Brown Line terminates at Lawrence and Kimball Avenues. Albany Park is accessible through, the Kimball, Kedzie and Francisco stations of the Brown Line, the Montrose CTA Blue Line Station, as well as by the Edens expressway (Interstate 94). The name “Albany Park” refers both to one of Chicago’s 77 official community areas and the traditional name of a neighborhood within that community. The official community is bounded very approximately by Foster Avenue and the North Branch of the Chicago River on the north, Montrose Avenue on the south, Elston Avenue on the southwest, and the North Branch of the Chicago River on the east. It is in Jefferson Township, which was annexed into Chicago in 1889.